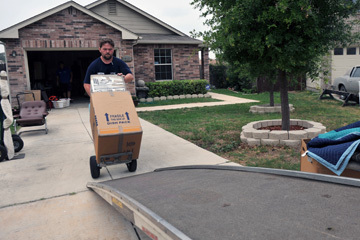 The whole process of house removal is indeed a daunting task. Packing all the belongings starting from furniture, home appliances, kitchen appliances, home décor items, and all other goods requires huge labour. And, you require to ensure all these goods are transported safely to the destination. Doing all this is not easy as it requires expert skills to complete the entire process of house removal work. The easiest and the safest way is to take up house removal services in Edinburgh and go about your transportation process. You will be at peace as all your goods would be moved into the new location without a damage incurred on them. When you avail house removal services in Edinburgh, it is always the professional expertise that you get to avail. They help you in packing all your goods, load them in the vehicle and finally unload them to help you settle at the destination. And, this whole process requires utmost precision to ensure a damage-free move. So, they send in expert professionals who are well-trained in carrying the whole work properly. The removal service providers make sure that all the work is done with utmost precision. They come with the required tools and equipment so that the process of packing, loading, and unloading is done in the perfect way. Generally, a professional removal company sends an expert to visit the location to inspect all the goods before giving a rate quotation. And, they accordingly come with boxes and wrapping materials to ensure that the goods are packed in the perfect way keeping the fragile items separate from the sturdy ones. The transportation is done in vans which are equipped with rails, racks, hooks and also protective blankets. This prevents them from a fall when they are moved from one place to the other. So, you get damage-free belongings even if they go through long travels to reach your new location. Settling down in the new house is easy and convenient by availing professional services. Edinburgh City Removals is one of the top-rated removal companies based out of Edinburgh. They are a team of experts and possess a fleet of good quality vans to assist their clients with the removal process in a safe and damage-free manner. With them, you also get the most reasonable rate in town. So, whether it is a residential move or a commercial move, you get 100% assistance with them. Also, if you want to avail part services such as only packaging assistance, porter services, or just the transportation services, you can easily do that. So, if you are planning a move, do not worry at all and let Edinburgh City Removals take care of all your needs.